As we prepare for the upcoming 2019 season, we take a look at the Triple-A call-up and fill-in outlook following 2018 and the Arizona Fall League. As this is a contract year for the MLB Umpires Association (MLBUA), we don't expect much in the way of staff umpire retirements or changes, but MiLB might still do some minor shuffling. The following is a look at the 2018 call-ups heading into 2019. Note that 2018 call-up numbers were elevated due to greater MLBU games lost due to staff injury/DL (most notably, Mike Everitt and Dana DeMuth). In 2018, MiLB call-ups handled 1,471 out of 9,720 (15.1%) MLB assignments, compared to 1,062 out of 9,720 (10.9%) in 2017, an increase of 409 assignments. 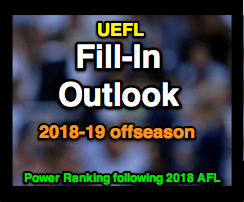 *New: The Fill-In Outlook for 2019 follows our midseason review from June 2018 and is part of our Umpire Scouting series for the upcoming draft. Stay tuned for instructions regarding league registration and to sign up for the 2019 Umpire Ejection Fantasy League season. Related Post: Triple-A Call-Up Progress - June 2018 (6/21/18). Chris Segal, Nic Lentz, Ryan Blakney, Chad Whitson - Segal, especially, is running toward a Drake/Guccione situation in surpassing the 500-games threshold with no MLB job available due to a lack of vacancies. If he stays the course in 2019, expect a promotion to staff in 2020. Lentz is 2016's Blakney with a spike in game assignments; it'll surely decrease in 2019 and likely follow Blakney's pattern of consistent-yet-manageable work, having proven his workhorse capability. Whitson's prospects look solid for a potential mass-hire situation following the impending ratification of a new CBA, assuming MLBU retirements follow. Ben May, Sean Barber, Nick Mahrley - May has slowly but steadily increased his MLB exposure while Barber had a resurgence of sorts in 2018. Mahrley in his sophomore season doubled his workload, not bad for an umpire who didn't appear in the bigs until the second half of 2017. Jansen Visconti, Jeremie Rehak - Visconti and Rehak, both 2018 AFL invitees, impressed in their debut seasons. The newest umpires ordinarily are relegated to Tier 3, but these two kept succeeding in the spotlight at an elevated rate. Related Post: 2018 Arizona Fall League Umpire Roster (10/1/18). Tom Woodring, Ramon De Jesus, Ryan Additon, Roberto Ortiz, John Libka, Shane Livensparger - Woodring is the veteran and leader of this tier, but how long will he wait? De Jesus is in a middle-pack predicament while Additon has received interesting treatment from the league, having officiated his first game of 2018 in June and vaulting to 74 assignments to close out the year. Ortiz and Libka are in wait-and-see territory while Livensparger for whatever reason is the only umpire with less than 50 games in each of his first two call-up years since Whitson in 2014-15. Click the column headers to sort by that metric. **1471 of the 9720 (15.1%) umpire assignments in MLB games in 2018 (2430 regular season games) were handled by AAA call-ups. **In 2017, 1062 of the 9720 umpire assignments (10.9%) were handled by Minor Leaguers. Legend: Rk (2018) and Rk (Total) refer to the umpire's rank of MLB games assigned in 2018 and all-time, respectively.